Thursday’s Commonwealth Download had the above heading. Below is the content. It couldn’t compete with the drama of the Astros-Sox game, but Wednesday night’s debate between Republican Gov. 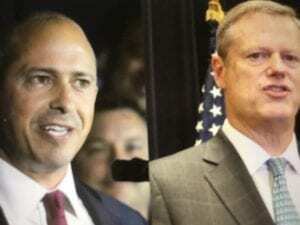 Charlie Baker and Democratic challenger Jay Gonzalez packed a lot of punch. Baker went turtle several times, rolling up into his shell when he was confronted with issues or inconsistencies that he didn’t want to acknowledge. Gonzalez, whose frank and feisty attitude was refreshing, nevertheless overplayed his hand, vowing to spend far more than his tax plans are likely to yield over the next four years. Baker has been dogged by his endorsement of the entire state GOP ticket – including big Donald Trump supporter Geoff Diehl for US Senate – and he has always tried to finesse why he is supporting a Republican he doesn’t agree with on many major issues. Gonzalez put Baker on the spot and asked him if he would vote next month for Diehl, who is challenging US Sen. Elizabeth Warren. Baker bobbed and weaved as best he could, but then he said he hadn’t made up his mind yet, which opened him up to the charge that he was endorsing someone for office who he might not vote for himself. After the debate, Baker said he had misspoke and will vote for Diehl. Baker’s other turtle was on whether he supports the construction of a new natural gas pipeline into the region, a litmus test issue for environmental advocates who say it’s unconscionable to prolong the region’s reliance on fossil fuels in the midst of accelerating climate change. Baker refused to say where he stood last week at a forum with Gonzalez put on by environmental advocates, and again last night he didn’t answer the question. Instead, he kept saying his focus would be on making the existing pipeline infrastructure safe and reliable. both turtle moments, Baker should have said what he really thinks and move on. It’s the hiding in his shell, trying to avoid taking a position, that gets him in trouble. Gonzalez had his own problems. The Needham resident knows budgets (he’s a former secretary of administration and finance under Deval Patrick) but he often plays fast and loose with his numbers. For just about every problem, he says he has a solution – a plan to raise $1 billion a year from a tax on college endowments greater than $1 billion and another plan to raise $2 billion a year from a surtax on incomes greater than $1 million. WGBH debate host Jim Braude tried to point out that Gonzalez’s plans were dependent on legislative action and, even if everything went his way, the $2 billion from the millionaire tax would require a constitutional amendment that would take at least four years to pass. Gonzalez expressed confidence the Democratic Legislature would give him everything he wanted and tried to move on. But then Baker zeroed in and pointed out that Gonzalez’s numbers don’t add up. Baker said Gonzalez’s plans for early childhood education would cost at least $1 billion, his transportation proposals would add up to many billions of dollars, his education funding initiative would be another $2 billion, and so on. It was obvious that Gonzalez was using the same $1 billion over and over again, or he was counting on other taxes not yet named or relying on funding that wouldn’t materialize for a long time, if ever. Baker didn’t address the merits of Gonzalez’s proposal, but instead underscored the Democrat’s tendency to seize on big ideas and ignore the cost and wrenching changes needed to achieve them. He pointed out that Vermont, which embraced the idea of a single-payer system, scrapped it after concluding the cost would be $30 billion. “They couldn’t even figure out how to get to a plan,” Baker said. Baker suggested the single-payer proposal, as well as Gonzalez’s other initiatives, were all smoke and mirrors. “This is 100 percent trust me,” he said. Gonzalez also claimed It took 19 months for the Baker administration to hire an outside auditor to investigate the State Police’s payroll fraud scandal based on the April 2017 suspension of Trooper Eric Chin for payroll fraud, the hiring of Col. Kerry Gilpin and subsequent investigation. In September, Gilpin hired Ernst and Young to perform the audit. Great debate – Gonzalez was the clear winner while Baker came across in equal parts as indifferent, arrogant, and whining. Especially telling was Baker’s refusal to even look up from his notepad scribbling when Gonzalez asked how Baker can have the gall to endorse a neo-fascist Trump lackey like Geoff Diehl when Baker isn’t even sure if he’ll vote for the guy himself. And Baker cannot continue to blame his failures on the Patrick administration – if he hasn’t been able to clean things up in four years then he’s failed. Also, Jim Braude revealed his true colors – essentially Braude was doing all of Baker’s bidding for him, while Baker himself was nodding off – what we ended up with was a Gonzalez-Braude debate. Braude didn’t press Baker on anything, and was almost apologetic for even asking a question about the governor’s groping son. In the other direction, Braude’s insistence to Gonzalez that the legislature wouldn’t approve a tax hike on the rich had no basis in fact. The “millionaire tax” is a farce. It sounds good on the surface, but it will be ruinous for the state. It may raise a minor amount directly–but nowhere near $2 billion (or at least after the first year). The $2 billion assumes that there is absolutely no change in millionaire tax returns. This assumption is totally nuts—a tribute to the Beacon Hill’s inability to think clearly. When you look at total inflows into the state, total tax revenues may very well go down! On top of this, when I ask state legislators about losing millionaires (just half of the problem from losing millionaire tax returns) they try to refute it by citing a paper in the Journal of Sociology which shows the opposite. They never bothered to read the paper, or even hire someone to read it for them. So, once we figure out that we are collecting almost nothing from the millionaire tax, or even losing tax revenue, where is the money going to come from? I really wish the v14 blog was dedicated to Newton issues only, and such post was discouraged. There are too many other forums to talk about Mass, or other important and pressing issues that do not relate directly to Newton. Now, this would have been a great discussion if we talked about what Baker/Gonzales meant for some of Newton’s problems. I know this is a narrow view of things, but otherwise these blogs just get too diluted. Neil P. I agree with the thrust of what you are saying, but I do think exceptions can be made for statewide issues that affect people in Newton as well as in the other cities and towns. And I agree in part on your contention that there are other venues to discuss many of these statewide issues. But I think you have to acknowledge that media and blog coverage of the race for governor has been very poor and scanty. I’d be satisfied if they gave just 20 percent of the time to this and to other statewide and local election campaigns that they gave to the most tiresome details of the Patriots pregame season. Neil P, V14 threads are almost entirely Newton specific. The governor’s race has been an exception. I understand your position. I think it would be great if we discussed “what Baker/Gonzales mean for some of Newton’s problems” on this thread. The first things that come to mind are the impacts each would have on the MBTA and schools in Newton. During Baker’s Administration the green line commuter stops in Newton have been reduced to the extent that unless riders are commuting to and from Boston at “normal” hours, there is almost no service. Even for some of the stops listed riders must flag down the train. Many times trains to and from Worcester fly right by Newton. There have been unfunded mandates for schools – those directly affect Newton.